The Dimplex Bizet is a contemporary style wall electric fire that can be fitted as a hang on the wall fire or as a hole in the wall fire. The Bizet features the market leading Optiflame effect and Dimplex fan heater which is the quietest fan heater on the market. The Bizet also has a reversible frame allowing it to have a white or black frame to suit your décor. is it convector or fan ? The Dimplex Bizet electric fire is a 2kW fan heater. DImplex say the fire can be wall or inset fixed. 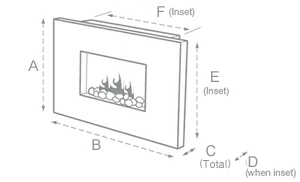 The only problem with fitting the Bizet fire within a marble surround would be that the back part of the fire measures 580 x 580mm which is wider than most standard fireplace openings.